Cynthia Vanda (b. 1937) was raised in Philadelphia, earned a bachelor’s degree in economics from the Pennsylvania College for Women (now Chatham College) in 1959 and a master’s degree from the University of Pittsburgh Graduate School for Public and International Affairs (GSPIA) in 1961. Cynthia joined the Peace Corp in 1961 to make a difference in the world. She was stationed in Nigeria where she taught geography and English in secondary schools. Returning to Pittsburgh in 1966, Ms. Vanda was employed at GSPIA where she trained Nigerian students in public administration. She served as the GSPIA representative on the University’s new Affirmative Action Committee and became well versed in that framework. Her own experiences with racism and sexism propelled her to become involved in the Committee on Women’s Concerns where she successfully lead the effort to have a women’s center funded by the University to provide a place for women to bring their issues. Ms. Vanda served as Director from 1972 through 1981. The center offered free counseling, classes and workshops, and published a newsletter. When the center closed, Ms. Vanda moved to the Provost’s office to focus on women’s issues at the University. She left the University in 1997. 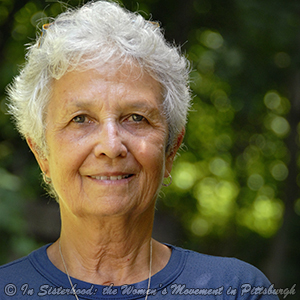 Ms. Vanda was co-founder of the Three Rivers Community Fund, an alternative to mainstream foundations, and served as President (1989-1999). The Fund continues to promote “change not charity” by investing in activist, grassroots organizations working to bridge divisions in the Pittsburgh region.